This is an interesting project for me, as much as anything because so little is known. I will write this as 'fact' so I do not have to keep putting in "as far as we can tell" type comments, but feel free to dispute as you will. 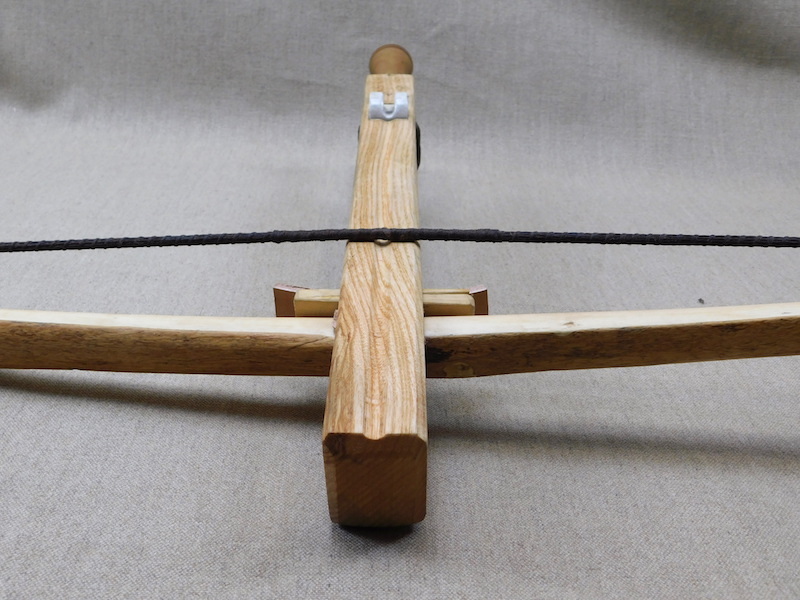 The Romans had a hand held bow type weapon called an Arcuballista. What it was exactly we are not sure as it was described how it was used, but not what it was (Vegetius). There are two carved reliefs of a hand held flexion bow weapon from late in the Empire that are taken to be Arcuballista. 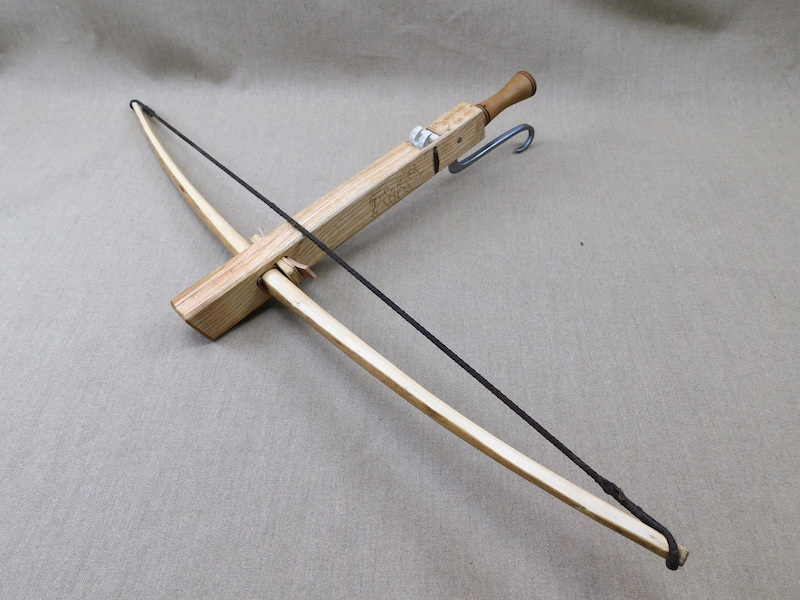 They have a bow at the front, a rotating nut at the rear and then a turned handle grip, meaning there is no real way to aim like you would with a crossbow or gun. The bows are composite. This very scant evidence is then followed by a yawning gap until around 1080 when there is a picture from I think Constantinople showing very similar crossbows in use - basically no change to the form. Rapidly from then they evolve to become the stocked bows we know. 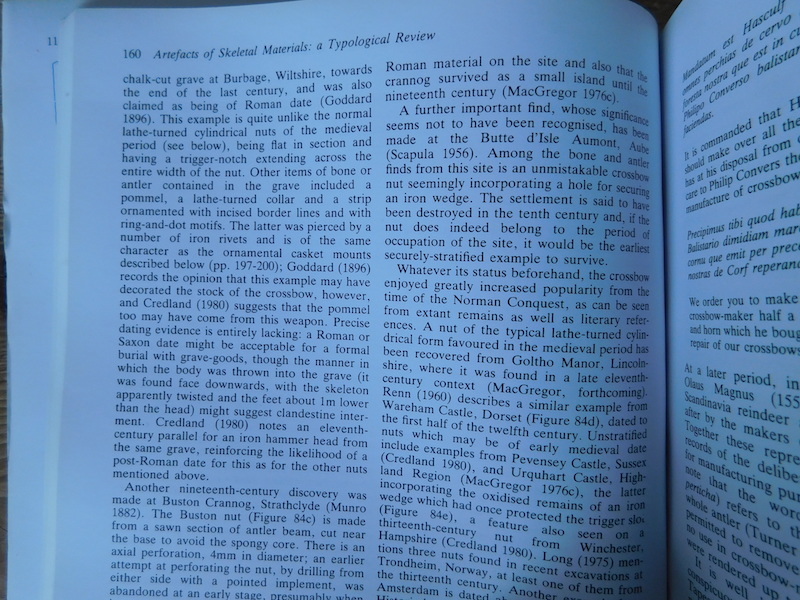 So from around 300 - 1000 there in no evidence of even their existence except for a few nuts and what may be interpreted as crossbows in Pictish stone carvings. 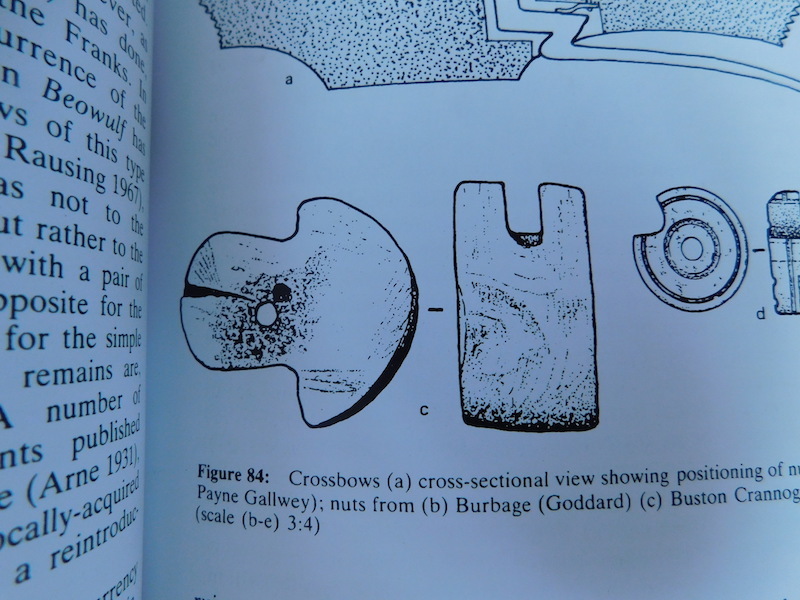 One of these nuts was found in Scotland and so along with the carvings my client and I accept the existence of crossbows in post Roman-pre-1000AD Pictish society and that they most likely followed the Roman pattern. That said, I felt it was unlikely that they would be composite in Scotland, so we opted for a timber bow and to add some Pictish feel to the piece my client asked for some carving in a Pictish style - and here we are. 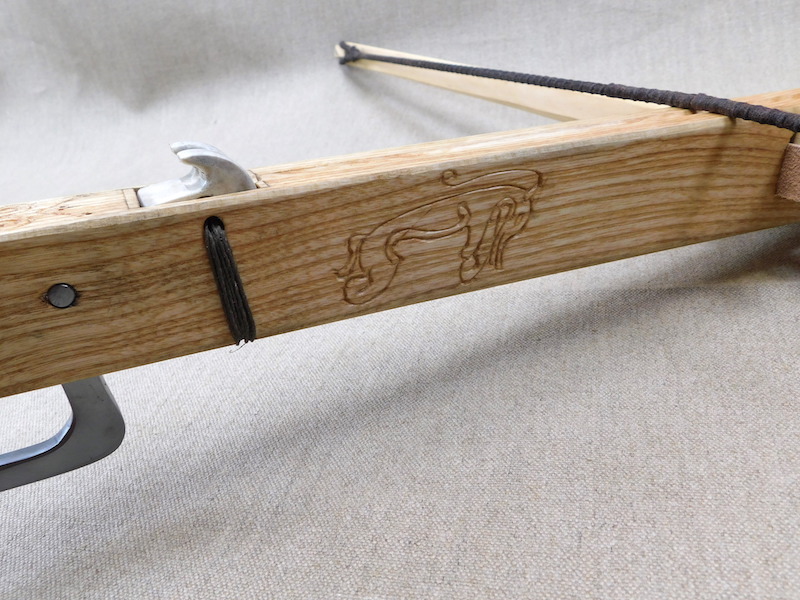 The stock is ash with a blackthorn handle, the nut is antler with a steel insert, and tied in with linen cord. 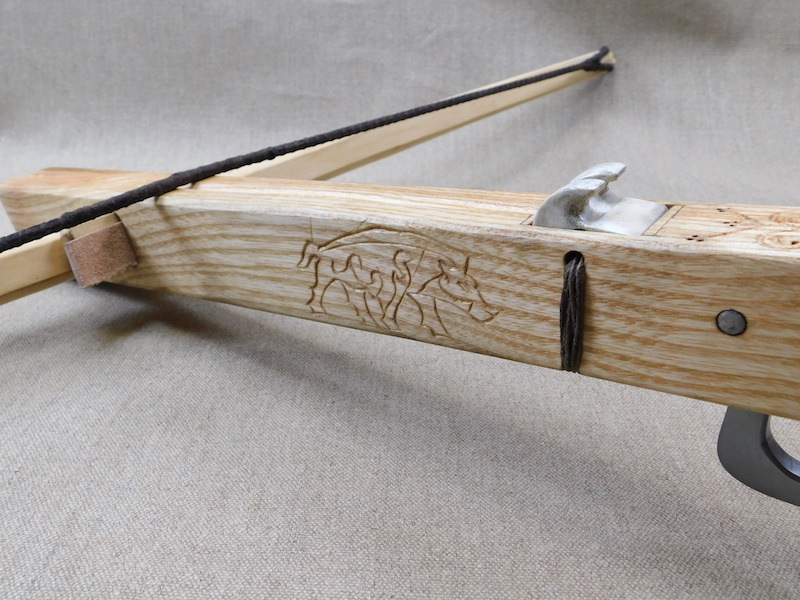 The bow is hawthorn and draws to 100lbs and the string is linen. I hope you like it and of course if you have any questions please ask away. The crossbow looks great - as do all of your pieces. 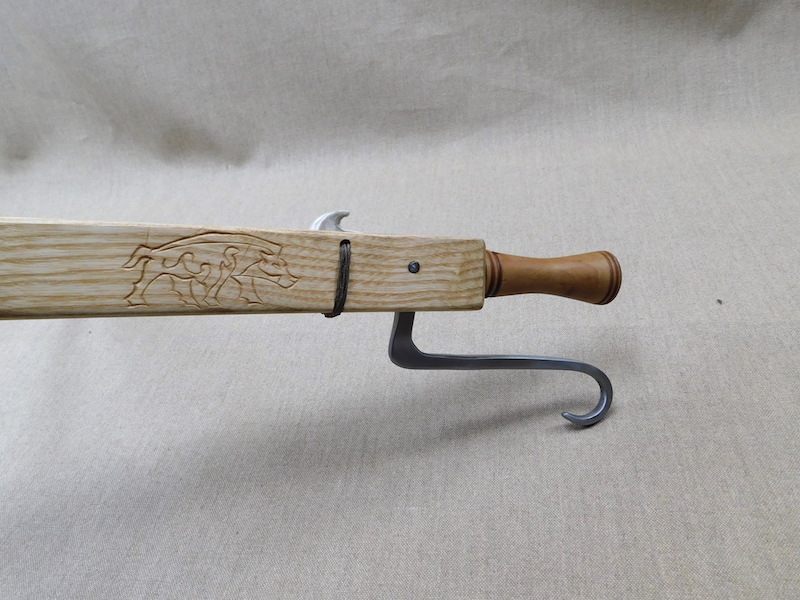 I love the boar carved into the tiller and the little details on the "stock" peg. 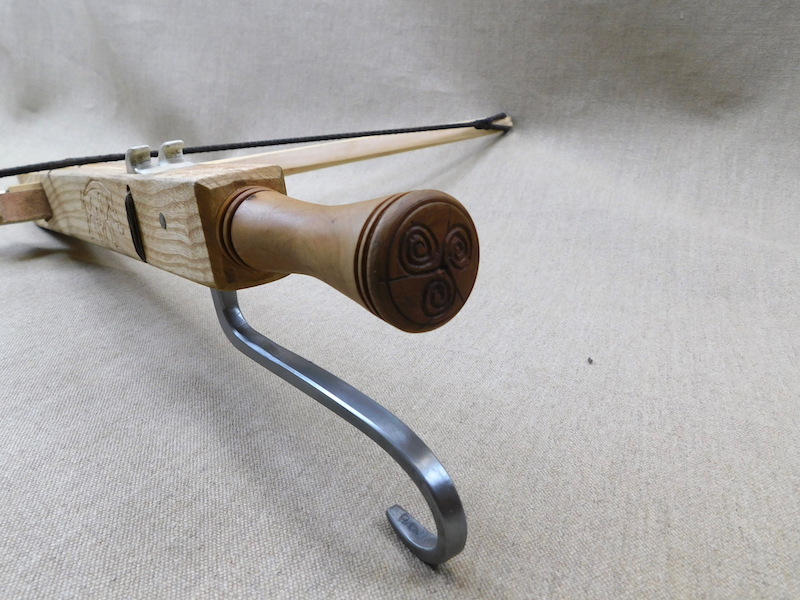 It is also an interesting speculative reconstruction - I confess that I am still somewhat sceptical about the early pictish use of the crossbow, but your interpretation of it as a borrowed technology of roman origin in post-roman Scotland is much more plausible to me. Why I'm sceptical: I just can't convince myself that the archers engraved into rocks definitely represent crossbows and are not simply slightly inaccurate or flawed due to the difficulty of carving or scratching into hard, granular rock, and the ease with which a mistake such as an extra line (interpreted as a tiller) could creep in. I was surprised that the theory gained such a lot of support in the past few years, seemingly only on the basis of some fairly ambiguous artwork. 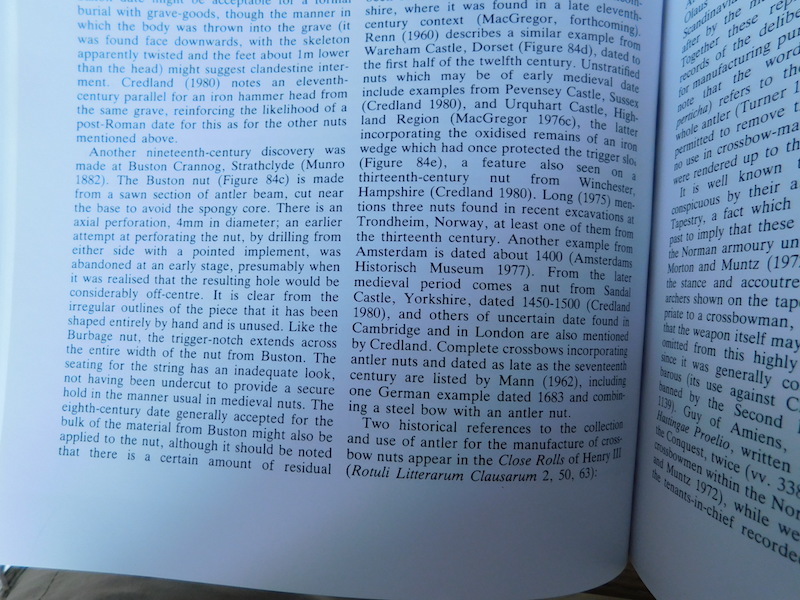 However, I'm intrigued by the find of the crossbow nut that you mentioned; that could change my opinion entirely. Have you got more information on that which you're willing to share? 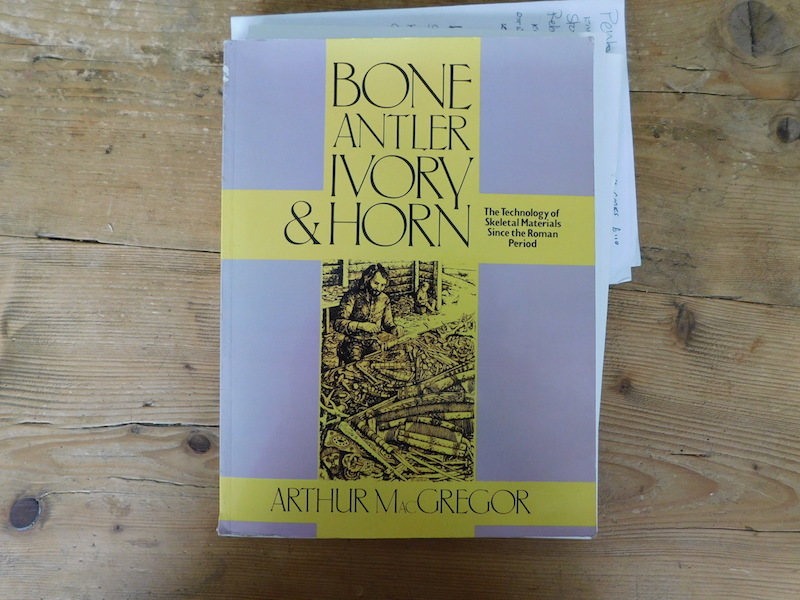 Also, to play devil's advocate for a moment, I also know that a form of crossbow was apparently independently invented in west Africa, so I won't rule out the possibility of early pictish crossbows, given more conclusive evidence. 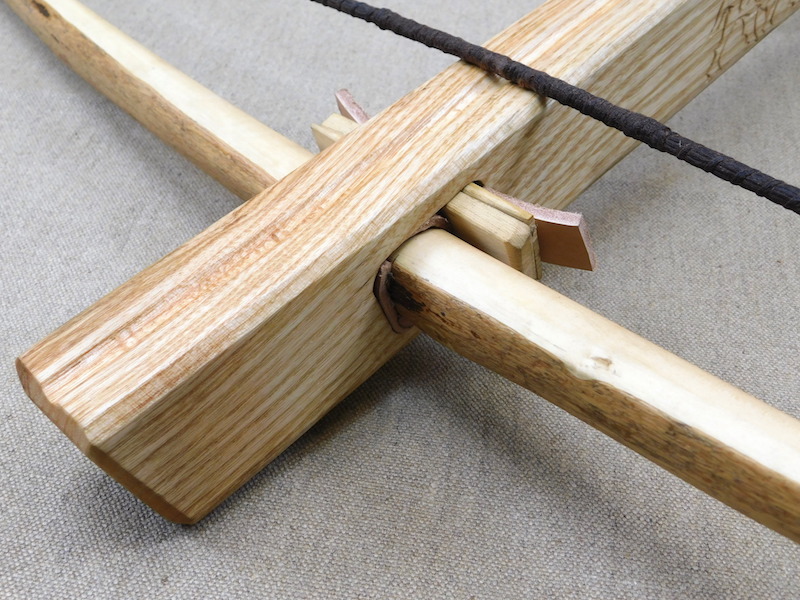 A last, highly speculative thought about the use of the original roman crossbows: I wonder whether these aren't meant to be used to defend a walled position - you could lean the bow against the outer edge of the parapet and fire down, holding onto the peg. Accuracy need not be great if your position is being assaulted by a large force - you just want several guys with crossbows raining down lots of arrows a-la area denial fire. I know that later in medieval and renaissance times, crossbows were used for exactly this purpose - any thoughts? Anyway, great bow. I wish it were mine! An interesting, speculative "reconstruction". My query is..have you tested it out ? If so..how accurate is it with that sort of grip ? I have not read the part in Vegetius, but I believe it was in reference to naval warfare, though one of the reliefs seems to show a hunting scene. I've always wanted to make one myself!